So have you tried some of my last post ideas? Did they do the trick? Or is your left brain critic is still active, chattering negative stuff at you and interfering with your creativity? 9) Play music. Pick your favourite inspirational pieces and paint to them….or dance while you paint. 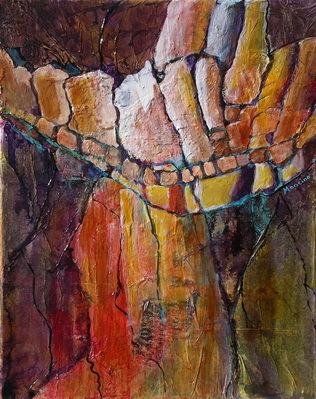 In Fractured Earth, I used pieces of torn up old watercolour paintings, foil paper, heavy media pressed through a template. I experimented with new colours and iridescent colours. 11) Get looser, bolder and have fun. In all the pieces shown here, I painted on top of old paintings that I was no longer satisfied with. So, I was not afraid to ruin a canvas and could allow myself to be bolder. 12) Use a bigger painting surface or a shape to paint on that you have not used before. 13) Use big brushes – really big brushes: 2-3 inch or more. One artist I know uses a commercial window squeegee. 14) Paint with no brushes at all: for example, use your hands and/or fingers, use a turkey baster, a shower scraper, throw the paint on with a pail, use grout spreading tools, or large palette knives. Get really wild and creative with your painting tools: dip your running shoe in paint and use it as a stamp or dip your small spare tire in paint and roll it onto your canvas. Come on, you can think up something really clever to get the paint onto the substrate! 15) Paint more than one piece at a time. Try doing 3 or 4 or 6 canvases at once. Pour some paint on, then move on down the line to the next painting. I find this one is really helpful so I can’t/won’t start to fiddle, or won’t leave it time to dry! 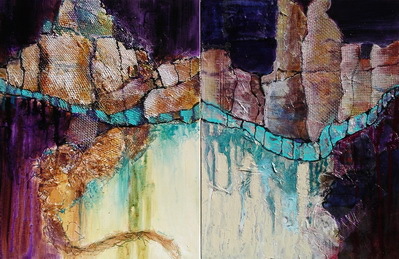 Here are two paintings that work alone or could be combined as a diptych. 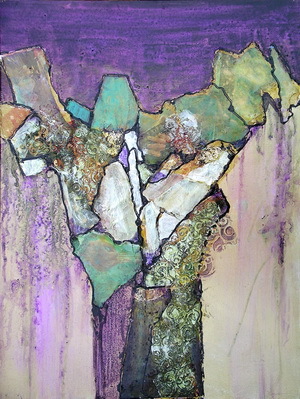 I collaged in tissue paper, onion bags, fish netting I found on a beach in India, and foil papers. I poured and dripped. I left these marks more delineated and stronger than I usually do. 16) Work upside down. This helps you to see and abstract your shapes. 17) Use your non-dominant hand. Unless you are ambidextrous, this will make it mandatory to get looser. 18) Work on yupo paper or another slippery surface where paint merely floats on top. (Use acrylic mediums to simulate slick surfaces.) This will make the paint float around and you will not be able to be as precise. You can also employ a wet cloth to wipe away sections (with watercolour or still-wet acrylics). After acrylic paints have dried, you can use rubbing alcohol (methyl or ethyl alcohol). This allows you to lift and remove paint you don’t want…..this also helps bring back high values so you don’t have to be so careful to reserve the whites in the beginning. 19) Tell yourself, all “mistakes” are fixable, because they are! Here are just some examples: rub out with water or alcohol to recover the whites. Spritz with water, alcohol or salt to create blossoms and blooms. Overpaint with gouache. It is more heavy-bodied and covers up what is underneath. Use gesso (it is a really opaque “coverer”). Use white acrylic ink. It has a lot of pigment and covers very well. Collage over parts of it. Again on this piece, I painted over top of an old figurative piece of the Duchess of Windsor. I can still see her coming out from underneath. I used iridescent and interference paints, stamps I made, textured rice paper and heavy-bodied mediums pressed through grids. I also glued on copper metal paper that I then excised to make the ancient symbols. 20) If it really seems to be a failure and hopeless: crop the piece and frame sections of it, or rip it up. Then use the pieces in other collage paintings. If you incorporate these processes, you throw nothing out. Everything becomes useful. As well as having a good time, you will be saving the planet from an excess of garbage. I recommend: “My Stroke of Insight”, by Jill Bolte Taylor. At age 37, she had a massive stroke. A brain scientist, she watched in amazement as her motion, speech, memory, and self-awareness shut down. Taylor spent the next eight years recovering. That recovery taught her how to put aside her left brain critic and engage her right brain. It also unleashed a torrent of creative energy. She suggests many ways for you to activate your creativity. Her fascinating story is also in a short lecture on Youtube. I encourage you to try some of these ideas. Or develop some of your own. Please share them with me or let me know how I can encourage you to loosen up. I’d love for you to let me know how you make out, if, and how, they work for you. Most of your tips really apply to life generally…& sometimes hard to do!